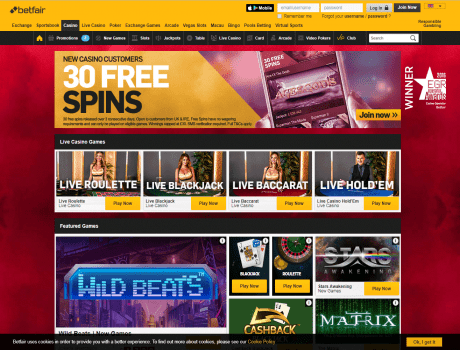 All new Betfair Casino players will receive a 30 Free Spins to try out a selection of best slots. Your free spins are released over 3 consecutive days, 10 per day. Accept now and come back again and again to enjoy a few games on the house. Your 30 free spins will be available until 23:59 (BST) over 3 consecutive days from sign up. If you do not claim them each day they will expire and not be reapplied. There is no wagering on winnings from your free spins. All winnings are capped at £30, £10 per 10 free spins.